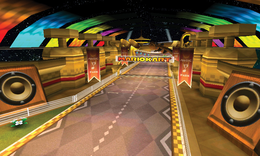 Music Park (known as Melody Motorway in the British English version) is the third course in the Flower Cup in Mario Kart 7. The course takes place on a winding circuit floating in space, containing several musical instruments, including a giant xylophone and piano as well as a giant tambourine that acts like a Mushroom Trampoline from Mushroom Gorge. All instruments make their own sounds when driven over or passed by. The course reappears in Mario Kart 8 and Mario Kart 8 Deluxe as the third course in the Leaf Cup. The starting area of the course. The course starts off with a road containing trumpets and a large violin. Following this is a piano turn, with two Big Piranha Plants planted near the end and surrounded by circles of light, near which is a small ramp sided with a Jump Block. These lights around the Piranha Plants are to be avoided by racers. Otherwise, the plants will bite, causing the victim's kart to tumble end over end. After xylophone and glockenspiel turns, the tambourine appears, acting like a bouncy mushroom. In this section of the track, the walls are adorned with musical staffs. Then there is a split road containing Bouncing Notes jumping from side to side, and three metronome beats are played just before they hit the ground. After a minute and 52 seconds have passed, they start to jump right after they land (this feature is omitted in Mario Kart 8 and Mario Kart 8 Deluxe). After that there's a big turn with a smaller tambourine trampoline which can be used to cut the turn. After another left turn there's the finish line. Any players that race beneath these notes will be flattened and spun around. However, if players are near one of the notes when it hits the ground, they will be launched into the air and can take advantage of the air time by gaining a short boost. The course in Mario Kart 8. Music Park returns as a retro course in Mario Kart 8 and Mario Kart 8 Deluxe as the third track in the Leaf Cup. There are no changes made to the track layout, but there are several cosmetic changes: The course banner now resembles a guitar neck with strings, and the Mario Kart logo is now multi-colored. The Bouncing Notes now squint when they land. In the area they are in, the metronome played is louder than before. A few additional coins have also been placed around the track. Small Bouncing Notes have been added at the start/finish line, jumping in time with the music. The staff ghost for this track is Baby Daisy on the Biddybuggy, with a time of 2:24.468. In Mario Kart 8 Deluxe 200cc, the staff ghost is Daisy with a time of 1:36.529. Toad at the starting line, waiting for the countdown to begin. Princess Peach and Yoshi, driving on the giant piano. Piranha Plants on the course. Lakitu, approaching two giant Bouncing Notes. A released screenshot of the course, revealing the name of the track. Toad racing on the track. Toadette, approaching giant Bouncing Notes. The banners around the track have the name "Music Park" on them, even in the non-American English versions of the game. Similar to Electrodrome, Music Park has several panels, that when driven over, make up several ascending beats. This page was last edited on April 5, 2019, at 22:24.